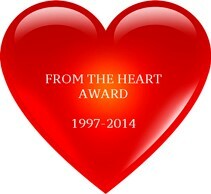 The first “From The Heart” award was presented, quite appropriately, on Valentine’s Day, February 14, 1997. The first honorees were Patty Boyd (volunteer) and Pat Hoeft (Auction staff). In the beginning, the award recipients were truly surprised when they unassumingly joined the casual gathering of a handful of volunteers and staff to be unexpectedly honored by their colleagues with balloons and flowers. After nineteen years, the presentation has grown into a well-attended and highly anticipated celebration attended by up to 100 volunteers, staff and guests. Following that experience, future award recipients or their families were told ahead of time (shhhh!) by the award selection committee that they had been selected for the award to ensure their attendance. Although awardees are now notified of their pending honor so they will be at the party, the element of surprise continues as the honoree’s name is not revealed to others until the day of the party. The tradition of the Rocky Mountain PBS “family” has been longstanding due to the unique bond shared between the RMPBS staff and its volunteers (aka “unpaid staff"). Now a 19-year tradition, the “From The Heart” award has grown from a casual “Thank You” into a lovely ceremony witnessed by an enthusiastic audience of volunteers and staff. Light refreshments and heartfelt accolades are shared as the “element of surprise” continues to be the primary and highly anticipated focus of this annual celebration.